11-year-old Preston Mrljak poses for a portrait after cutting himself on thorns while running through the woods in Grantsville, Maryland on August 19, 2018. President Donald J. Trump speaks to the media after the annual turkey pardoning ceremony at the White House before departing to his Mar-a-Lago club in Palm Beach, Florida to celebrate Thanksgiving with his 11-year-old son, Barron, and wife Melania on November 21, 2017. Kent Walker, Senior Vice President and General Counsel of Google (far left), Sean Edgett, General Counsel member for Twitter (far right), and Colin Stretch, VP and General Counsel of Facebook (center left), attend a hearing to focus on Russia’s interference in the 2016 U.S. elections and what steps they are taking to mitigate future foreign interference on November 1, 2017. Milinda Jefferson, a U.S. Coast Guard veteran, weeps during the 6.1k Run For The Fallen’s closing ceremony in section 60 at Arlington Cemetery. The run is organized by Honor and Remember, a veteran and Gold Star Family organization that seeks to individually recognize nearly 20,000 Fallen Service Members since the USS Cole (October 2000). Each mile along the 6,100 mile route from Fort Irwin, California to Arlington National Cemetery, runners pause for a short ceremony to remember by calling each name out loud of the soldiers, sailors, airmen, coast guard and marines killed on a different day since the War on Terror began. Caroline (left), 19, rests her head upon her girlfriend, Jane, 21, in Ohio University Alden Library on January 30, 2019. Mia Barnes, 21, poses for multiple exposure portrait in Athens, Ohio at dusk. 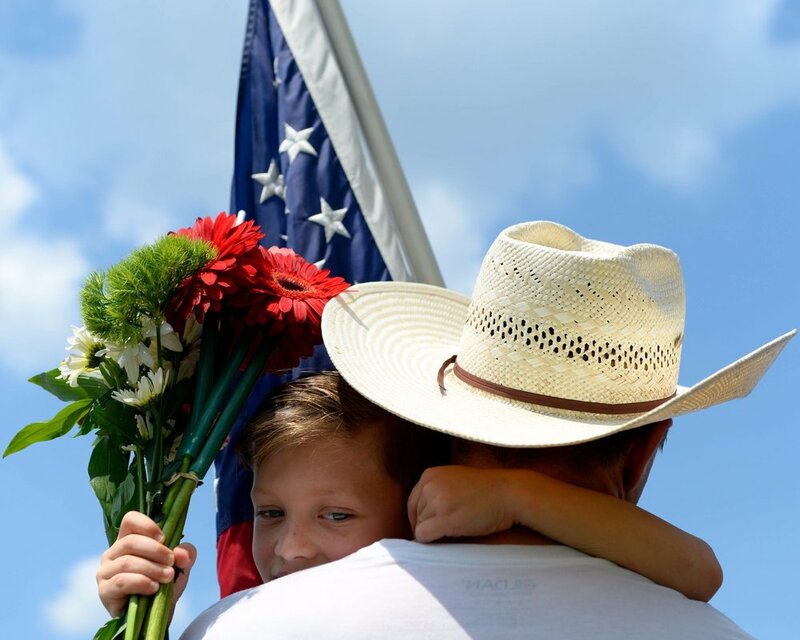 Aiden Stillman, 7, from Fort Bragg, North Carolina, hugs a runner in "America’s Run for the Fallen” as they arrive at Arlington National Cemetery to complete their final mile on August 5, 2018. Stillman’s father, Jack, died of cancer in January, a month before he was scheduled for deployment to the Middle East. The run is organized by Honor and Remember a veteran and Gold Star Family organization that seeks to individually recognize nearly 20,000 Fallen Service Members since the USS Cole (October 2000). Each mile along the 6,100 mile route from Fort Irwin, California to Arlington National Cemetery, runners pause for a short ceremony to remember by calling each name out loud of the soldiers, sailors, airmen, coast guard and marines killed on a different day since the War on Terror began. Marabella Lopez poses for a portrait at the Washington D.C. gay pride parade on June 9, 2018. When asked what this years Capital Pride means to her, Lopez replied, "This is how we kind of express our liberty, our happiness...sometimes we cross difficult moments, especially me because I'm from a Latin country." Lopez left Guatemala to avoid persecution for her identity, "They don't have the open mind to accept our community...I had to leave my country because my life was at risk and I live free." This is her third pride. 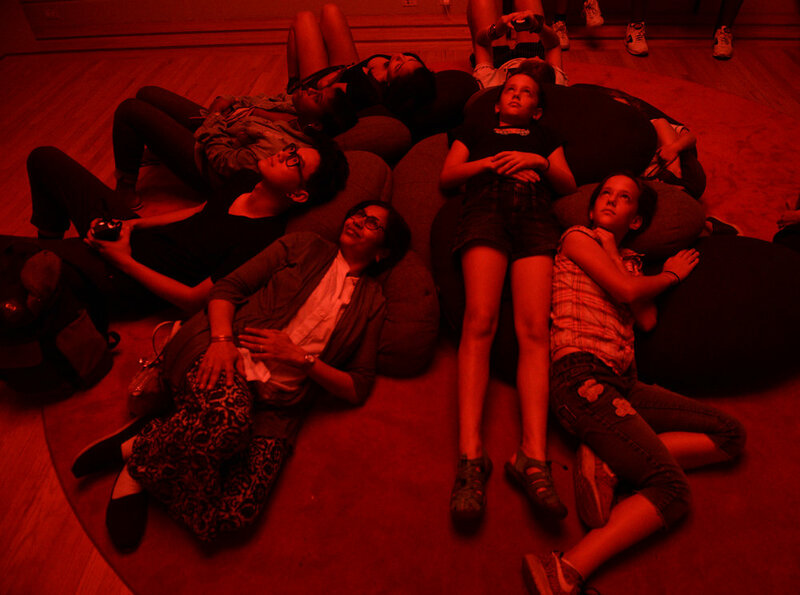 Museum Goers relax on bean bag chairs while gazing at Christopher Schardt’s Nova, an immersive art installation at No Spectators: The Art of Burning Man exhibition at Renwick Gallery in Washington, D.C. on July 7, 2018. The installation is intended to “bring” the viewer to the environment of Burning Man with rave music and LED lights. Third grader Lauren Shumway holds up a lollipop while jumping on her trampoline outside of her Nelsonville, Ohio home. Rylie Cress, a 4th grader at Alexander Elementary School, shows off her catapult made in science class on October 18, 2018 in her home in New Marshfield, Ohio. A couple takes a moment while waiting for the orange line at the West Falls Church metro station in Falls Church, Virginia on July 7, 2018. A woman poses for a portrait on the Brooklyn Bridge in New York City. Festival goers to the Jacksonville Ohio’s Old Settlers Reunion are reflected in a ticket booth stand on September 2, 2018. Haidin Pargin, 3, Diamond Pargin, 7, Ella Cress, 10, and Michael Pargin, 6, wait for pizza and cake during twins Ella and Rylie’s 10th birthday party at Dow’s Roller Rink in Nelsonville, Ohio on October 6, 2018. Democratic members of Congress thank former Representative Gabrielle Giffords, who was injured in a 2011 shooting, for speaking at a rally to honor the victims of the mass shooting in Las Vegas and to demand passage of the bipartisan King-Thompson legislation to strengthen background checks and establishing a bipartisan Select Committee on Gun Violence on October 4, 2017. A Counter protestor gets relief after being pepper-sprayed by police during a rally on the east side of the Eisenhower Executive Office Building as the white nationalist Unite the Right rally is being held across from the White House on August 12, 2018, in Washington, DC. The Supreme Court heard oral arguments on Dec. 5, 2017 for the Masterpiece Cakeshop, Ltd. v. Colorado Civil Rights Commission case. The gay couple involved, Charlie Craig and David Mullins, comfort one another afterwards on the steps of the Supreme Court during a press conference.